You don’t even notice the house at first. It’s the lush, green thicket that catches your eye. The overgrown bushes, the heavy vines. The path to the alleyway that has been devoured by grass. 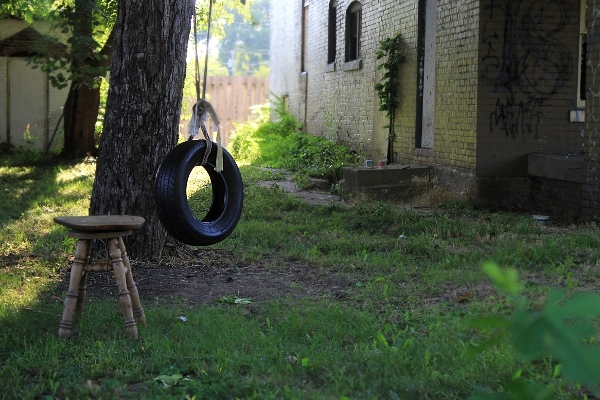 Once your eyes have woven through the jungle, you see the tire swing. And the shopping cart that blocks the front sidewalk. And the graffiti. On every wall, on every slice of plywood, there are spray-painted signs that “tag” the home. There’s been a graffiti war. There’s also been activity. 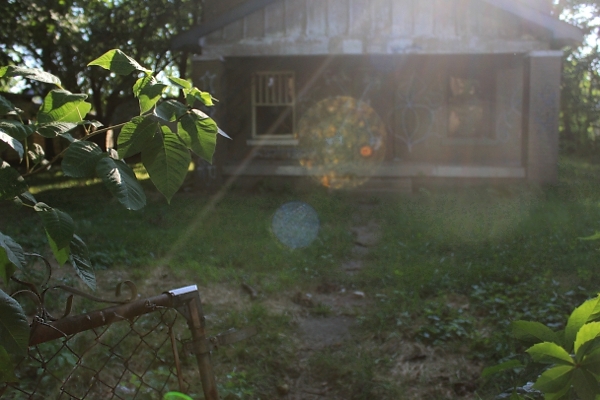 Despite the weeds and the boards and the darkness, there have been people here. 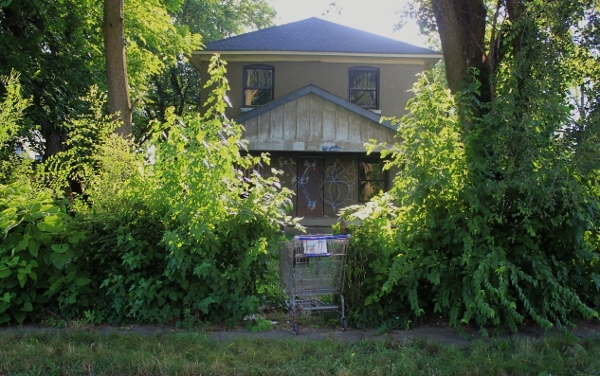 The shopping cart, for instance, is a recently placed “lawn ornament,” as it was not present when you last passed by. There is a plywood board that has been removed–from what window, you’re not sure–and angled against the south side of the house. And then–on the step that leads to the side door–you see two coffee mugs. Casually set down. Marking a spot. One white mug with a red logo, one dark mug plastered with Sylvester and Tweety. It’s creepy, you think. Don’t get too close, now. This is a place to explore with your eyes, not your feet. At first glance, you think the home is a double, given its wide porch and square look. But then you see there’s only one door on the front. That it is constructed of brick. 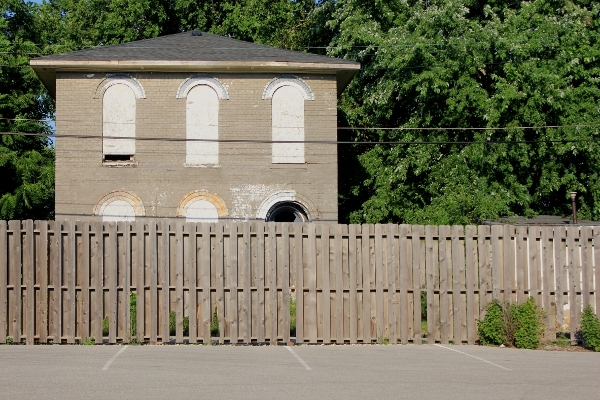 There’s a low-pitched roof and window hoods and–oh, gosh–it’s another Italianate. It’s old, too. On the 1898 Sanborn Map, it was floating there by itself, surrounded by nothing. Just a pink box on some paper, it was. You can bet that it had been there for awhile, too. 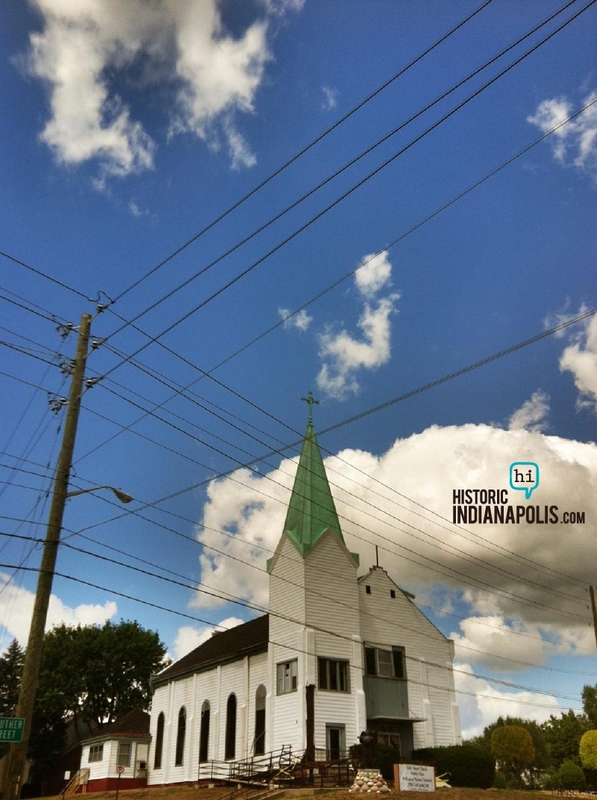 Italianates were popular from approximately 1850 to 1880, and were excessively so in Indianapolis during the 1870s and 1880s. You guess that this particular home was built somewhere in that margin but, hell, there are a couple of sources that list the home as an 1852 construction. 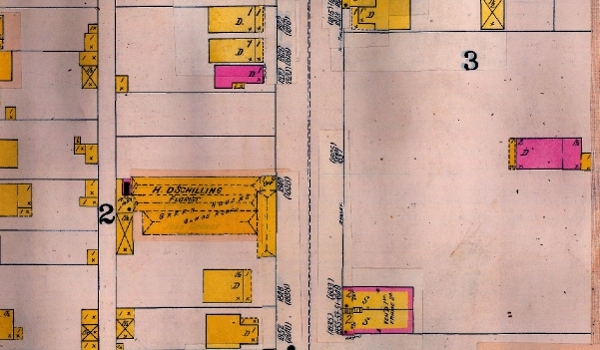 The 1898 Sanborn Map shows 1838 Olive St. (the pink dwelling to the far right) was once more secluded. 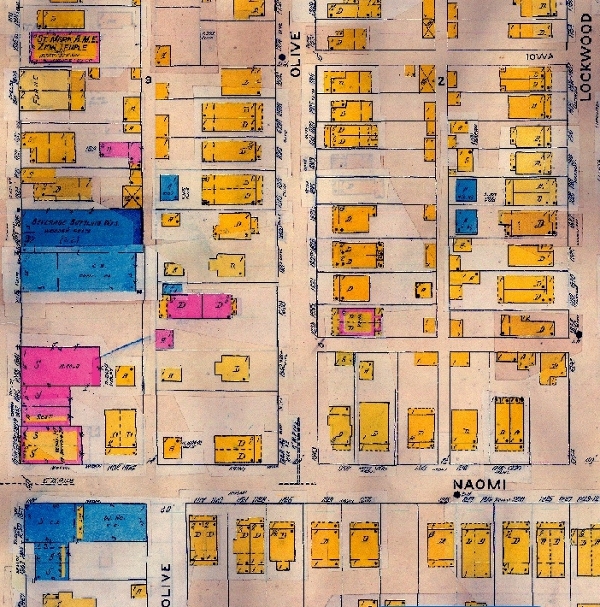 The 1914 Sanborn Map shows that the area surrounding Olive Street has greatly expanded. 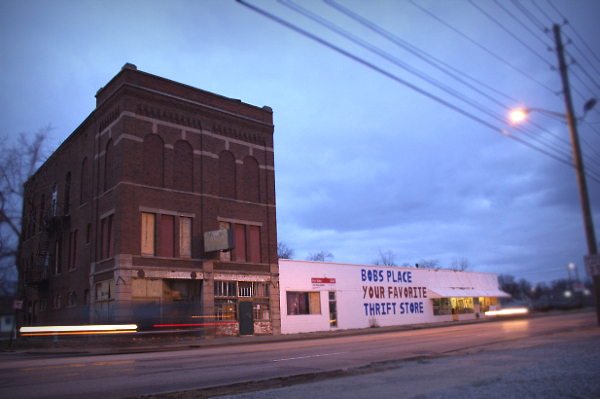 1838 Olive St., however, was just one of a few brick buildings in the area. (The home is depicted as the pink dwelling in the center-left.) This particular Sanborn, which is updated to 1941, shows that the home had also been divided into two units: a front unit, and a back unit. You have a devil of a time tracking down any of the original inhabitants, but you do find a couple of intriguing characters from the mid-1900s. The 1930 city directory, for example, lists a man by the name of Melchior Himmelhaver as living at the home. Records on ancestry.com say that Himmelhaver died later that year, in April. Members of his family continued to live in the area, however, and even appeared in the city directory 10 years later. By 1951, the home had been split into a multi-family building, one with a front half (1838 Olive St.) and a back half (1840 Olive St.). You learn, after looking at the 1951 city directory, that there was “no return” for the back half. However, the front half was inhabited by Italian Presti Salvatore, who was born in Italy in Aug. 1887. Members of his household included his wife, Rosa, and relatives (you are unsure if they were cousins, siblings, or children) Eugene, Carol, and Biagia. In the ’70s, homes in the area were removed in order to make room for the Interstate. And, in either 1999 or 2000, you notice that the brick buildings behind the house, the ones on Shelby, were also torn down. That means this is the only brick structure left in this immediate area, you think. And it’s owned by an LLC, a subsidiary of a bank. Just like that house on Elm Street. 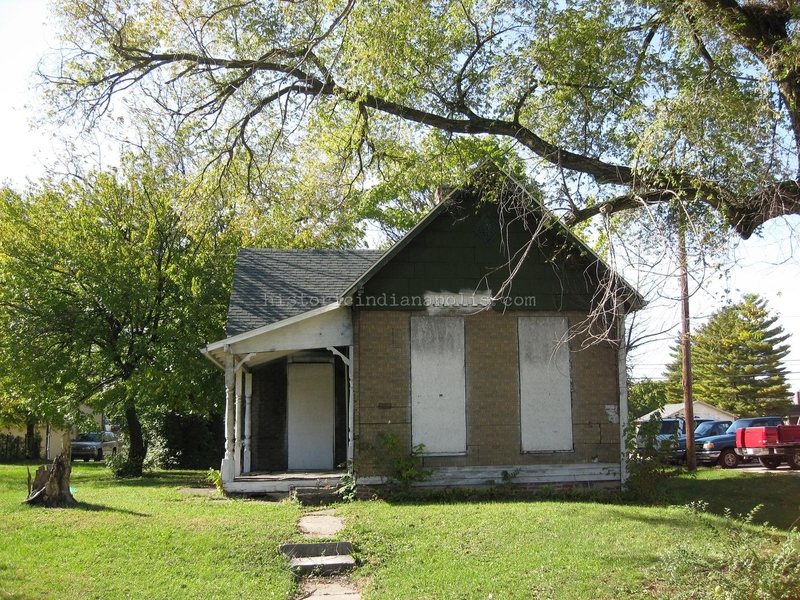 Owned by an LLC, overseen by a bank … oh, these houses. Just like all those all those other ones that are boarded up, forgotten, and then torn down or left to rot. … Not this one. Not this one, too. Thank you for sharing and writing this. It was the perfect way to start my morning with a hot cup of coffee! I’ve wondered about this house for years. I love seeing those arches while driving by. So sad to see homes in this condition. Another nice piece. There is so much potential, so much to be done, in this city. I was born in Indianapolis and I knew Mr. Presti as we called him in 1961- for my part. He grew grapes, made wine, and hot sauce was a punishment for mouthing off. He rented to my mother and us children. We had a cat named felina. I only know mostly what my older sister told me. just a note to say thank you for the info on this house, I now live in the back half and the whole house has been repaired and made livable. 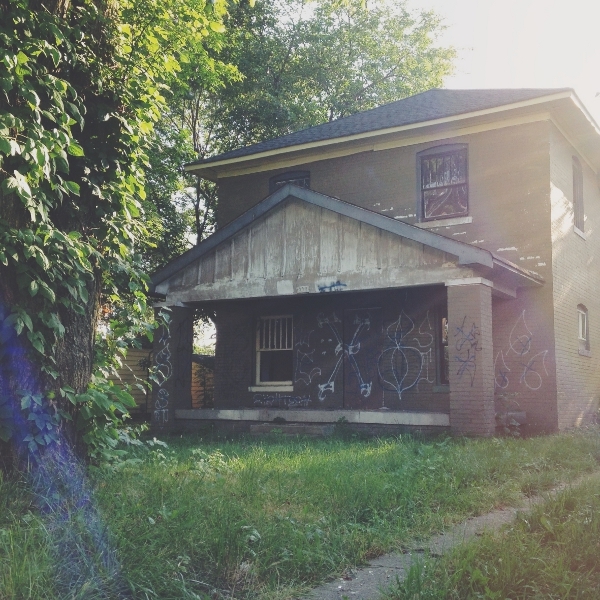 I love this house and if I ever win the lottery , it is my dream to restore it to its original state. 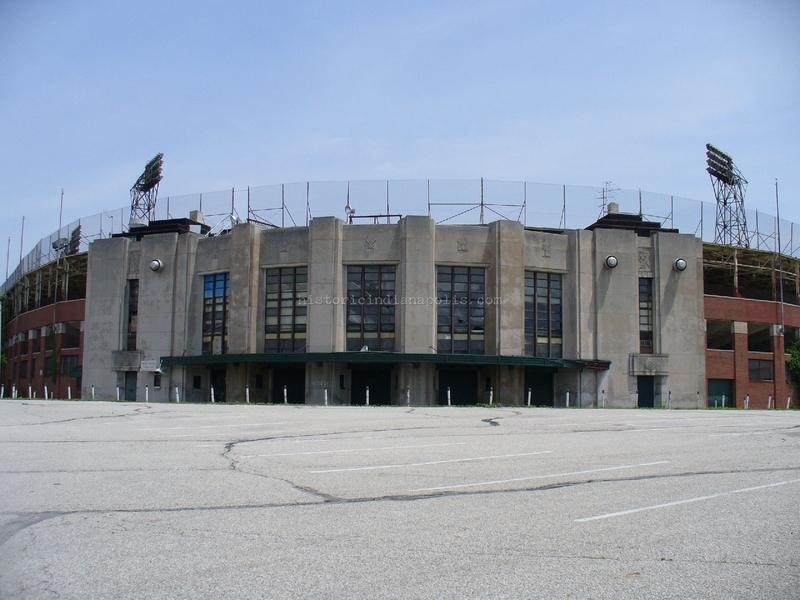 I was thinking this morning about a manufacturing plant on a curvy street on the near South Side and found HI. Then I found this lovely tribute. Dawn Olsen, you are to be commended for this work.. I was born in Indianapolis (I prefer to spell it out) in Methodist Hospital. The birth records were destroyed, I’ve been told, by a fire there. I am now 80 years old, living near my grandchildren in Colorado, but have relatives and friends still in the area (Greenwood, also). Dutifully and thankfully watch “Good Bones” on HGTV, sometimes with tears in my eyes. Again, thank you, Dawn, for your preservation interests in this non-native-to-you state’s capital city.